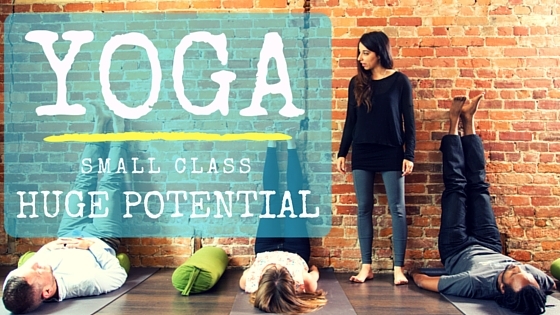 The goal of our yoga program is to offer classes that are more than just physical exercise. We work to help you become healthier, happier and rejuvenated as you travel your journey to greater physical, mental and spiritual wellness. Our instructors will work with you to improve the health of your body and mind while providing an oasis from the stress of an urban lifestyle. This is an opportunity for you to connect, build resilience and grow. This is not your average drop in class, this is a 6 week yoga therapy program dedicated to your health. All levels of yoga participants are welcome to attend, and our emphasis is towards beginner and intermediate students. Private yoga therapy sessions are also available. Preregistration is required. Maximum 5 students per class. Call us at 416-260-6038 and let’s talk about it. Having always had an interest in alternative wellness, Kaitlyn’s passionate exploration of holistic health began eight years ago and has culminated in the study of yoga, Reiki and nutrition. 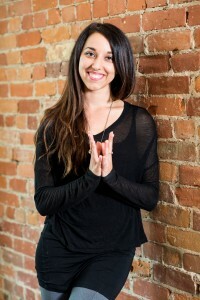 Certified as a holistic nutritionist and yoga instructor, Kaitlyn is committed to inspiring, educating and listening to clients through continued support, motivation and compassion as they take hold of their health. Kaitlyn graduated with an Honours BA in sociology from Bishops University and went on to study Holistic Nutritionist at the Canadian School of Natural Nutrition. As a nutritionist and as a clinician, Kaitlyn teaches and encourages the essential ingredients of a balanced, holistic lifestyle, inspiring others to achieve optimal health and vitality by honoring their body’s natural needs. Her clinical practice is inspired by an ongoing fascination with the human body and its potential to heal itself. Kaitlyns introduction to yoga came from two very wise teachers, her parents. By observing the benefits it brought to their lives and specific health conditions, she was hooked after her first class. Since then she has been exploring different styles, philosophies, and Yoga communities, including the emerging field of Yoga Therapy. Kaitlyn is a certified Yoga instructor with the Canadian Yoga Alliance and teaches in a manner that arouses ones creativity, compassion and sense of empowerment. Kaitlyns dedication to the realization of our inherit beauty and her attention to alignment, enables her students to access the benefits of regular practice, and to enjoy the entire experience Yoga has to offer. Life is a Celebration of the Heart. Natalie is a passionate advocate for holistic health. As a yoga therapist and teacher she believes that yoga practices should be accessible to everyone and, as such, offers many different therapeutic-based classes to allow all ages and fitness levels to participate and fully benefit from the healing practices of Yoga. Natalie has a strong desire to teach individuals how to help themselves. She delivers simple breath-based yoga practices that supports and empowers the individual to improve their lives on all level physically, mentally, emotionally and spiritually. As a person who has recovered from depression, trauma and chronic pain, Natalie believes that even in dark times there is still hope for a better future.